This recipe was inspired by Brigitte Nguyen’s winning recipe on Food Network’s the Ultimate Recipe Showdown. I’ve been thinking about making this for months and it finally came to life last night and I’m glad it did! I looked at Brigitte Nguyen’s Recipe, twisted it up a little bit with the flavors that I like in there and made a super duper juicy Vietnamese Pork Burger. The main difference between my recipe and her recipe is she added Pate to it and I used a Sriracha Mayo and added honey to the seasoning for the patties. The patty was extra juicy from the marinate and you can taste tons of Asian flavors in every bite. My brother and sister in law said it tastes sort of life a Xiu Mai (Vietnamese Meatball) that is fried instead of steamed. Also, all the toppings on the burger is similar to what you would get when you order a Vietnamese Sandwich. This is a must try recipe for burger fans! Place Lean Ground Pork in a mixing bowl. Finely mince jalapenos, shallots, and garlic and add it to the mixing bowl. In a separate bowl, whisk together fish sauce, Maggi Seasoning, honey, sugar, lime juice, black pepper, and five-spice powder until sugars are completely dissolved. Pour seasoning to mixing bowl with the ground pork. With your hands, mix the minced veggies, seasoning, and lean ground pork and form the patties. I noticed that ground pork doesn’t hold together as nicely as ground beef does, so I after forming the patties, I put the patties in the refrigerator until cooking time. I could have grilled it, but decided to pan fry the patties instead. In a big frying pan, put some boil and turn the heat on MEDIUM HIGH. Cook the patties about 4 minutes on each side or until done. To make Sriracha Mayo, mix mayo, Sriracha and squeeze some lime in it. Depending on how spicy you like your spread, you add more Sriracha. Grill or toast the Kaiser Roll. 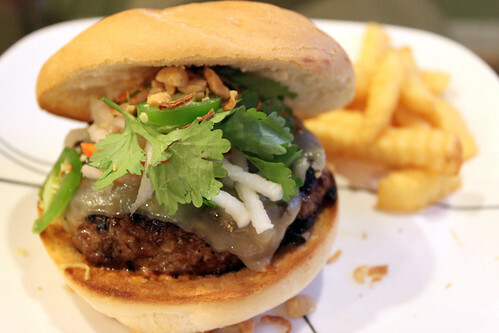 Spread the Sriracha to the bun, put the patty on top and add cheese, pickled carrot/daikon, fried shallots, jalapenos, crushed peanuts, and cilantro and serve. If you don’t like a certain topping, feel free to omit it, but these toppings will give it a very Vietnamese taste and feel.